Nature offers visual shows that even in the best fiction movies are not achieved. At the Ouzoud waterfalls you will spend an unforgettable day in a unique natural environment. The private tour begins with the pickup at the place where you are staying and from there we will head to Ouzoud. During the tour, we will enjoy the unique landscapes offered by the Atlas Mountains, passing through rural villages with peculiar lifestyles due, among other factors, to the natural environment in which they are found. 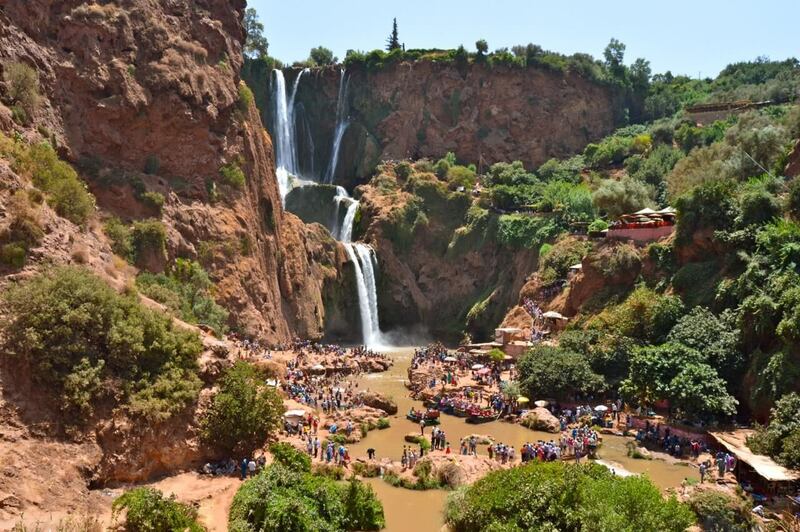 We will arrive at the Cascadas de Ouzoud, about 160 km from Marrakech, which are located in the village of Tanaghmeilt. With a height of 110 meters, watching the fall of the water is a true natural show that you can not miss. In this area you can choose between several trails to explore the waterfalls. The most daring can bathe in the crystal clear water of the river, although the temperature of this is quite cold. The peculiarity of this area is that you will find small monkeys that live here. During the tour there are several beach bars, with views of the waterfalls, where we can stop to eat and regain strength to continue enjoying the wonders of this excursion. When we meet at the base of the waterfalls, we will see boats that are responsible for bringing as much as possible to the waterfalls tourists who want it. A day that will not leave you indifferent and that you can take advantage of with your visit to Marrakech, where we will return in the afternoon and we will leave again in the place of accommodation.